Every company need not only improve in terms of its operations, products, and services but also in its ways of communication and continuous interaction with its consumers and prospect market. This will allow them to have a bigger market share and get the loyalty of the consumers who continue to patronize and promote their products and service offerings. The marketing department plays a very important role in terms of these processes and one tool that helps them be guided with the things that they are tasked to do is the marketing objective. 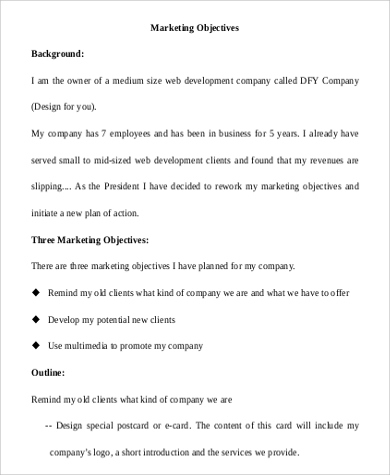 Other than this specific tool or document, we also have downloadable Sample Objectives that you may use in whatever purpose it may serve. 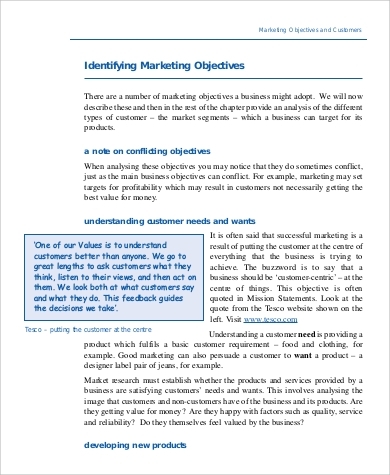 Marketing objectives are the end goals and aspirations that a company or a business is looking forward to achieve after the full implementation of a specific marketing process or activity suggested to be done varying on the results of a market study or research. These are the results that a company is waiting to take place after the promotion and product placement of their offerings in the market. 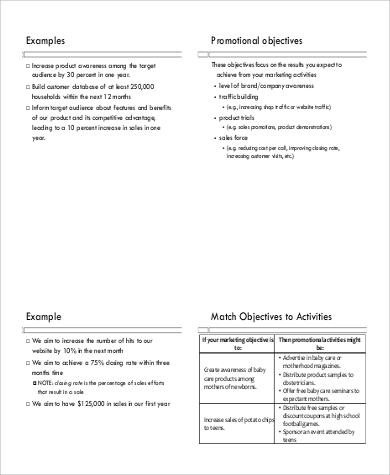 These marketing objectives should be bounded by a specific time frame to know if the process being applied in the marketing processes are usable and efficient. 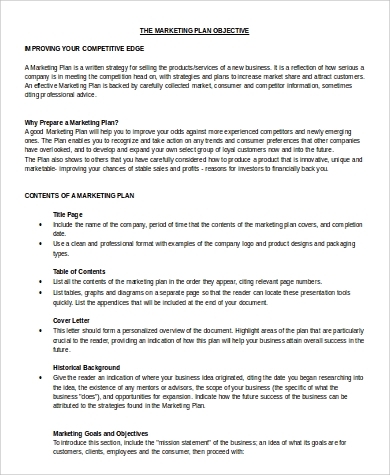 Hence, a marketing strategy is used to identify the factors that can help in achieving the end goals of a business, a company, or an organization. 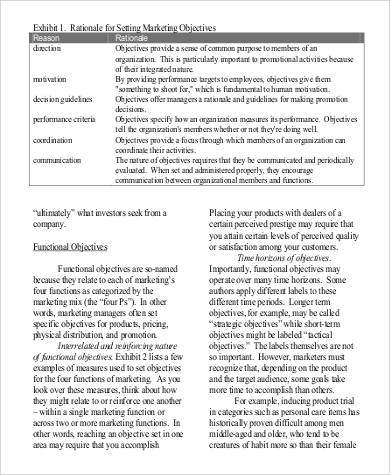 These are the characteristics that will make the use of marketing objectives more efficient and functional. 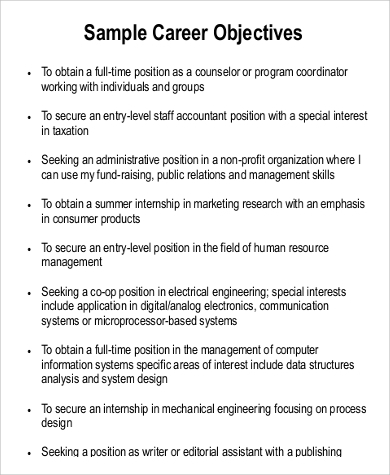 Other than our downloadable marketing objective samples, you may also download our Resume Objectives Samples. Sales increase is one of the most popular marketing objective that a company always wants to achieve. Marketing processes are done to assure that it helps the sales department of the company achieve more sales to assure that the company gets return of investments. A bigger market share is also needed to be achieved. Since more people are already aware of the product, there should be a positive change of movement in terms of the buying and selection trend of consumers within the target market. Marketing also should help the products and services of the company to be perceived positively by consumers and be the top of mind in terms of the product line where they belong. 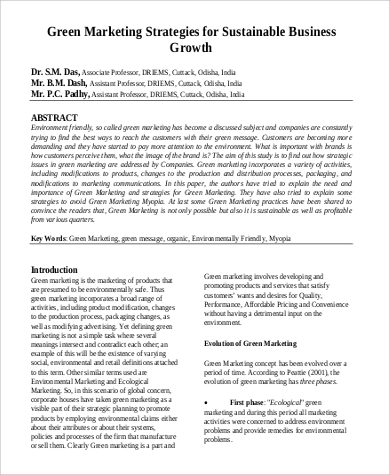 Penetrating new markets must also be a result of marketing activities and should be an objective of the company while curating marketing strategies. 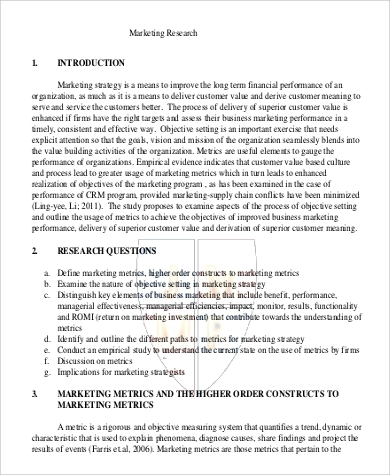 It is very important for companies, especially the marketing department, to create marketing objectives as it helps them to track whether they are in the right direction in terms of implementing and applying marketing practices, activities, and processes. 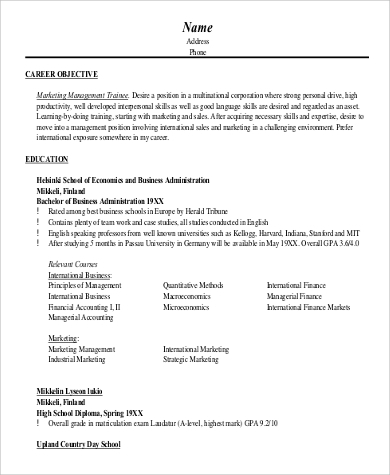 Other than our marketing objective samples, you may also download our Resume Career Objectives and use it as a reference.